Joey Cumagun, the praying runner. In every soldier’s life, there is a story of sacrifice worth telling. And that is what teacher Jose (“Joey”) Cumagun wants to tell his students. Cumagun, whose own story is worth telling itself, was one of 18 exceptional teachers chosen to participate in an educational program in 2017 sponsored by the American Battle Monuments Commission (ABMC). In partnership with National History Day®, the Roy Rosenzweig Center for History and New Media, and the National Cemetery Administration (NCA), ABMC created this yearly program three years ago. Selected teachers choose an unknown World War II hero to set the stage for their discovery of the soldier’s life and from which they will develop a WWII history lesson plan to be accessed by middle and high school educators all over the world from their website (https://abmceducation.org). Cumagun, a Special Education teacher at Deer Valley High School (DVHS) in Antioch, California, was picked from hundreds of teachers from all over the US and two countries who vied for this program. Working on the theme of “Understanding Sacrifice” the teachers learned about America’s role in the Pacific Theater of Operations during WWII, through immersion in lectures, reading materials, discussions, and a “walk in the footsteps of history” to places that influenced the outcome of that war and the lives of their subjects. Lesson plans were based on solid scholarship, integrated with Common Core Standards, and the use of interpretive materials provided by the ABMC. The program included research and eulogies about fallen heroes of World War II who are honored at ABMC cemeteries in the US, Pacific, Southern Europe, and North Africa. For this group, the focus was on soldiers who fought for the US and were buried in San Francisco, Hawaii, and the Philippines, where the teachers traveled to present their eulogies at the completion of the program. Cumagun, born in Quezon City and raised in Marikina, a suburb of Manila, studied in Ateneo de Manila, where he initially pursued an Engineering program with a combined major in Computer and Physics. But immersed in a school brimming with social relevance at the time, he could not see himself at ease in the laboratory or a computer room. In the flurry of social changes happening in the Philippines at the time, fresh from participating in the march to depose Marcos, he and four friends from Ateneo started a group to help teach poor children the necessary values and skills to realize their dreams and potential. After graduation, he taught history in 8th grade at Miriam College (formerly Maryknoll College) before pursuing graduate studies. It was around the time that he met his wife, Jinky, who was a pre-school teacher with a master's degree in Special Education. After they got married and had a son, they eventually moved to the US where Jinky worked as a special education teacher. Cumagun followed suit and got his teaching credential in Special Education and has been teaching in this field for over 17 years in California. 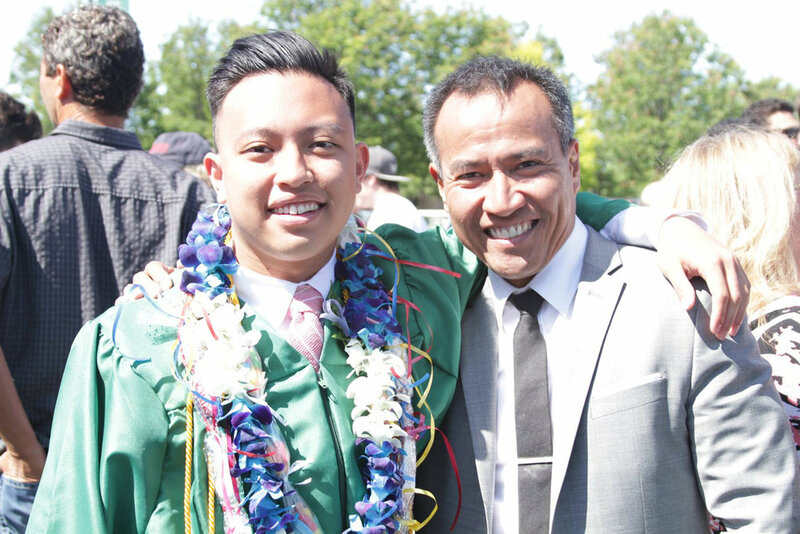 Joey Cumagun with son, Tim, who is now in Gonzaga University in Spokane, Washington, pursuing a degree in Journalism. His students' developmental disabilities include autism, Down's syndrome, mental retardation, cerebral palsy, etc. His teaching students range from 18 to 22 years of age. He notes, “A lot of our activities we carry out in the community. I provide them with as much community experience as possible. One of the focus in my instruction is giving students a work-based learning experience. To me, there is no better program than shaping a person’s life and directly teaching them how to be good and productive citizens. Cumagun gets to teach in a workshop in Miriam College (formerly Maryknoll College) where he taught years before he moved to the US. “Can’t Help Falling in Love with Special Education” Workshop, July 2017, at Miriam College, Quezon City, Philippines. With his experience in teaching special education, social studies, and history, he feels equipped to address the emotional and learning disabilities of his students as they learn about their war heroes. He hopes to move teaching to another level and dimension, with a learning trajectory that would deal with the emotional impact of war and a lesson plan designed to bring back that meaningful connection between the fallen heroes and the lives of students and staff. Cumagun chose to research the life of Sgt. Teofilo Yldefonzo, “because he was a Bataan Death March survivor. And he happened to be an athlete and a family man, to which I can both relate,” he explained. A marathon runner since 2003, Cumagun actively ran with his wife and son, Tim, to stay healthy and fit. He continued to run marathons as he taught and worked on the program. 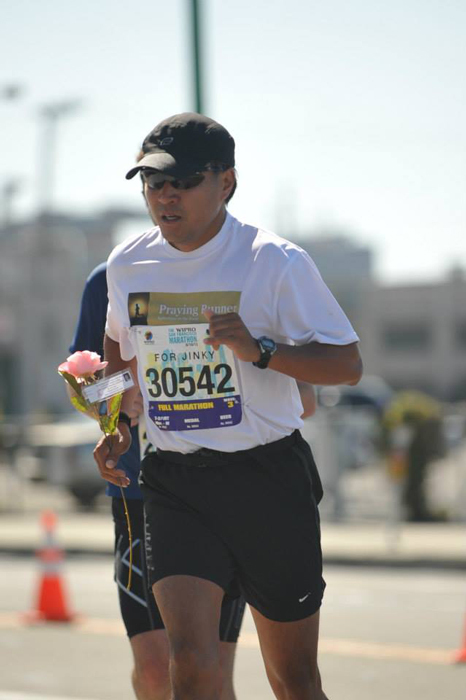 Marathon #32 – running and holding the pink rose for 26.2 miles at the The SF Marathon 6/16/13 (Father's Day). Cumagun lays down pink rose at the Finish Line – the pink rose is in memory of his wife who passed away from breast cancer in 2011. Cumagun’s marathons started with a step towards health but have now become his “journey of peace, joy, love, and life.” He had set his goal to run 50 marathons by the time he’s 50. Things came to a head as he celebrated his 50th birthday after completing his lesson plan and delivered his eulogy for his hero, Yldefonzo, in Manila. He and his son, Tim, went for a short vacation in Japan to celebrate the end of the project and the start of a new phase in their lives as Tim nears his own finish line in college. As Cumagun reflects on his life as a teacher and single parent, his lesson plan on war and understanding sacrifice is now ready for access around the globe; he also turned 50 last December and completed his 50th marathon on March 4, 2018. He will be ready to start another chapter of his life that will continue to involve the act of giving up something for the benefit of others, or for a higher purpose. Not surprisingly, he recently signed up to donate his kidney to an ailing family member. Suffice it to say, understanding sacrifice is definitely a lesson Joey Cumagun can teach very well. Manzel Delacruz is a freelance writer living in San Francisco.